The Earth's atmosphere is actually a churning sea of fluid, though it's easy to forget when you're just hanging out, breathing it all in. 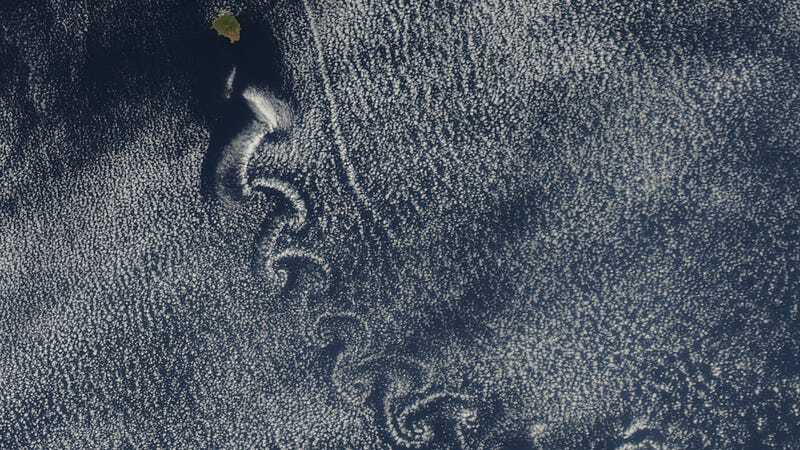 This satellite shot of a tiny island in the Pacific shows the spiral trails it leaves as an ocean of air swirls by. These strange spiral eddies are called von Kármán vortices, named after their discoverer, Theodore von Karman, a co-founder of NASA's Jet Propulsion Laboratory. 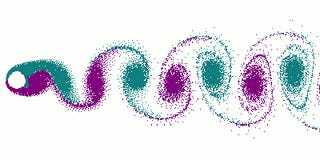 The phenomenon occurs when an object blocks the flow of a fluid, and causes the fluid (air, in this case) to whip around both sides, and bump into each other on the back end, creating a trail of concentric spirals. It makes way more sense when you see the process in action. It's almost like latte art, except the atmospheric coffee is the part that's moving while the stream of milk is a stationary island.